The photographer Paul Strand spent some 5 months in and around South Uist documenting the people and the land, which can be seen in his book “Tir A’Mhurain: The Outer Hebrides of Scotland”. 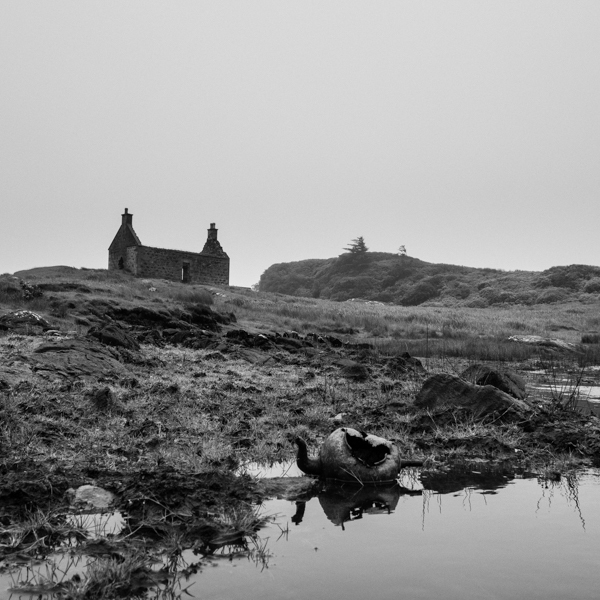 During his stay he took a photograph of this house and the outcrop behind it from the other shore of Lochskipport. Back then, the house had a roof and was lived in, now it is a shell and is the back drop to a small fish farming operation. What adds to the poignancy of this shot of decay is the kettle, rusting and discarded lying in the stream. Found in situ, I had to “warn” my kids off from picking it up and studying it until I had got my shot :). You can see more of my photography from the Outer Hebrides here.